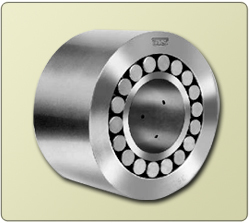 Back-Up Roller Bearings are sorted into altogether 5 section height group and marked accordingly. Group 0 is the smallest & group 4 the largest section height group. The key numbers 0 to 4 express the exact cross section of the Bearings. As can be seen from this table, each of the 5 section height group has a tolerance of 0.002 mm. This means that the pairing by sets of 7 Back-up Bearings, on one arbor, even when using partial sets of adjacent section height group can still be carried out within a tolerance of 0.002 mm. The very reduced section height tolerance of the bearings can only be achieved by measuring the bearing rings and assembling them with a specific roller grade. Great care must be taken to keep the parts of a bearing together & not to interchange them with parts of another bearing. 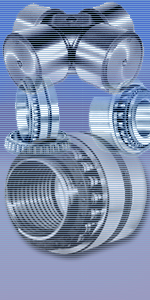 In practice, bearings of the same size are generally mounted with a transition fit on the arbor. They then form a height line parallel with the axis. When rolling strip, that is narrower than the max. width capacity of the mill stand, the bearings in the middle are subjected to higher loads than those positioned at either end of the arbor. As the center bearings are thus undergoing greater wear than the bearings at the ends, it is recommended to regularly change the positions of the bearings on their arbor to ensure a longer service life of the component parts. It is, therefore, important to establish and maintain up-to-date records in this respect. The seating positions of the various Back-up bearings on the arbor or in the mill stand, their respective service times and when the changes were carried out are all recorded systematically so as to avoid adverse effect of the inner ring wall thickness variation. Place the ring on the arbor in such a way that the arrows marked, on the inner ring faces, to indicate the largest wall thickness, are in line. The inner rings subjected to stationary load should be rotated to another loaded zone each time the arbor is dismounted for inspection. The arrows which indicate the largest wall thickness variation can be used as an aid when rotating& lining up the inner rings in a new loaded zone. The outside diameter of the Back-up Bearings must be reground from time to time to remove any indentations and flats generated during operation. For regrinding, we recommend a grinding arbor capable of carrying 3 outer rings. When dismounting the bearings, care must be taken not to mix up the roller sets and inner rings of one bearing with the parts of another bearing. The various bearings are numbered consecutively. At the time of entry into service, fix the intervals at which the loaded zone of the inner rings should be changed. As the loaded zone of the inner ring is limited to a small part of the circumference, regular rotation will ensure uniform wear of the inner ring and will definitely prolong the services life of the bearing.